D is for dog, Danielle, Debbie, and so many other D words and names and this CHARM IT! 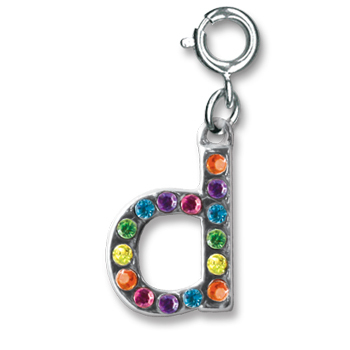 Rainbow Letter d charm lets you create fun and colorful personalized charm bracelets. After all, there's nothing quite like a personalized gift and our fun and sparkly acrylic stone Rainbow Letter Charms let you personalize your CHARM IT! accessories or create personalized charm bracelets, charm pins, and charm necklaces. This stylish lower-case letter d has a rainbow of acrylic stones and is sure to bring sparkly delight to the wearer. With a simple snap of a clasp, girls can personalize their CHARM IT! jewelry with this adorable CHARM IT! Rainbow Letter d charm. A is for apple, Andrea, Autumn, and so much more and you can create colorful personalized charm bracelets with this fun CHARM IT! Rainbow Letter a charm. I is for ice cream, Isabella, Iris, and so much more and you can create colorful personalized charm bracelets with this fun CHARM IT! Rainbow Letter i charm. S is for smiles, Samantha, Shelby, and so much more and you can create colorful personalized charm bracelets with this fun CHARM IT! Rainbow Letter s charm. Y is for yodel, Yolanda, Yasmine, and so much more and you can create colorful personalized charm bracelets with this fun CHARM IT! Rainbow Letter y charm. So many colorful links makes this rainbow charm bracelet super-cute and perfect for charms. The puppy on this adorable little CHARM IT! Puppy Charm cannot wait to be your friend. This colorful CHARM IT! Daddy's Girl charm has sparkly purple heart, white stars, pink heart, and colorful lettering.